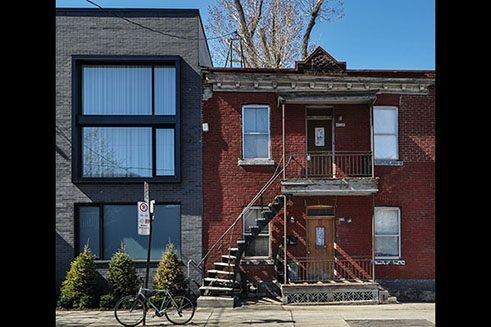 Haunted by the ghosts of the past and mistreated by the ideology of progress, which is confirmed by the suburbanization of neighbourhoods, Montreal is starting to forget itself and is slowly fading away. A historical and critical walk with strolling journalist and historian Jean-François Nadeau. Built on an island Montreal turns its back, however, on the water, turned in on itself. To approach it you have to unravel the threads of the highway architecture of the 1950s. On these expressways perched on concrete structures you can picture the automobile of the time as an eagle descending from the sky onto the haunts of the worker ants. 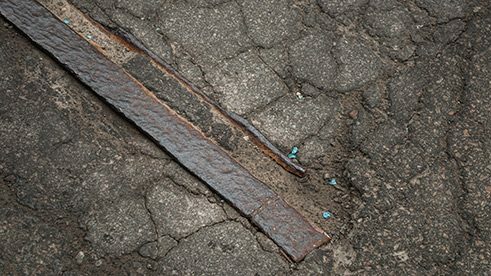 Montreal had had its tram tracks covered over but nevertheless they come back to haunt it each springtime after the winter freeze when the old metal resurfaces through the asphalt on the main thoroughfares. Montreal is cut from a different cloth from that of Quebec City. It doesn’t possess the smooth charm and plastic beauty that constitute the pride of those cities with so-called world heritage status. Houses in elegant rows, streets delicately designed, wrought iron grating, that’s not Montreal, except for a tiny part of the old town, formerly protected from the Indian attacks by a wooden stockade. Old things, old people: for a long time Quebec has wanted to present itself this way to the North American visitor. By habit the St Laurence valley has continued to see itself this way, to admire itself through a tradition morbidly absorbed with the times gone by, in which the past is seen as an act of embalming needed to preserve the idea of a country meant to please others, a country that only becomes ours with this end in view. On the banks of the great river “nothing must die, nothing must change”, Louis Émond observed in his novel Maria Chapdelaine. ”Our master, the past” the cassocked minds would repeat thereafter. However, all this past has long since disintegrated in the shadow of the skyscrapers erected on the spot where the Iroquois tribes used to gather at the foot of the Mount Royal. And it continues today when we gabble on about our awareness of our heritage, a convenient idea readily indulged in by us humans, happy not to have to think ahead when history and collective life are at stake. In Montreal the facades of the old houses bordering the commercial thoroughfares have been shattered. You see this when on a stroll your eyes take in the other side of the street: the surge of small and large businesses has grafted new additions onto the old already existent structures. This results in facades of very different sizes advancing and retreating from the street and making for constantly uncertain perspectives. 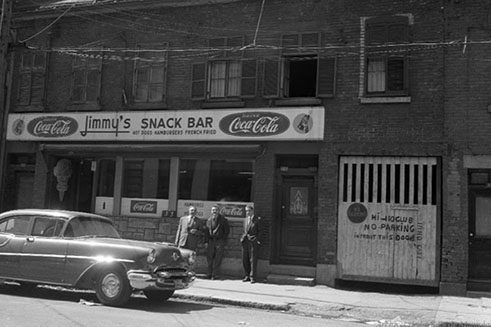 Restaurant “Jimmy's Snack Bar” located in the Red Light district on Hôtel-de-Ville Ave. in 1957. Destroyed houses in Victoriatown (Goose Village or Village aux oies), 1962. 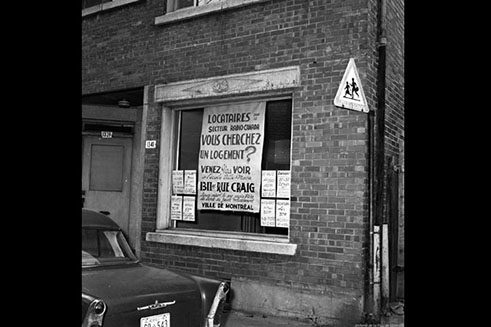 Announcement for the expropriated tenants of the Faubourg à m'lasse neighbourhood, almost entirely demolished to make room for the Radio-Canada building, 1963. Aerial view of the excavated Radio-Canada, formerly the Faubourg à m’lasse, 1964. A modern version of the “Querelle des Anciens et des Modernes” in the Mile-Ex neighbourhood in Montréal, 2014. Construction of condos in the neighbourhood of Griffintown. New condos in the Mile-Ex neighbourhood. 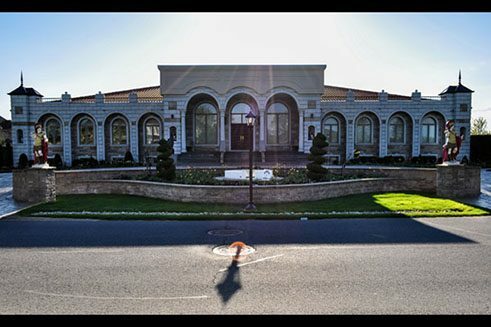 “Aesthetics of collage” in the suburb of Brossard, near the shopping centre DIX30. After the war those neighbourhoods of low-rise houses recalling the dark times of the colony alarmed the city administration. The sight of those rickety houses with corrugated iron or slate roofs did not fit in with the epic past we needed to forge for ourselves in the name of the future metropolis. A short news clip of the time shows Mayor Drapeau explaining how he intended to slice through the heart of the old Montreal with an expressway that would permit the cars to roar through. The project never was realized. But other suburbs were completely demolished, anyway. 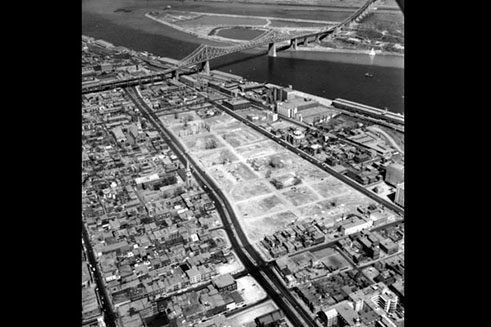 In the East the molasses neighbourhood (“Faubourg à m’lasse” as it was called) was entirely destroyed by cranes to make ample room for an immense parking lot capable of accommodating the workers of the public television and radio. 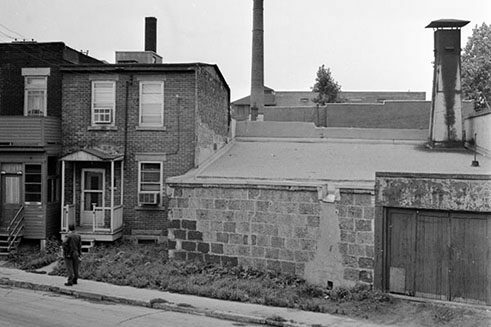 The same for Victoriatown, a sector situated near the old port. In the centre the so-called red light district, the hot bed of illegal gaming, prostitution, alcohol and all-night parties, disappeared entirely to make way for low-income housing. By knocking down the houses of the poor we were driving out poverty. The blight of social injustice remained in place, however. One day walking through the midst of these colourless, characterless buildings dating from the end of the 1950s, I met an old lady. She had been living there since they were originally built, she told me. But only a few days after having moved there with her husband, he had been killed by an explosion in the gas mains. Since then she had been living alone with her memories. In Montreal tens of thousands of people were similarly displaced and then forgotten about. And they have gone on demolishing since. St. Lawrence Boulevard, former Mecca for burlesque theatre in North America, now only offers to the eye an unflattering string of empty lots and abandoned buildings, interrupted, it is true, by brand new buildings with the cold look of what some call “international architecture” preferred by money in all the countries of the world. The same for Sainte-Catherine Street where, along with a group of other buildings, the Spectrum, that mythical music venue, was demolished before firm assurances were given that something else would be built there before long. Also disappeared in the same row of houses, the Anatolia restaurant whose sweet cakes, simply served, I loved. 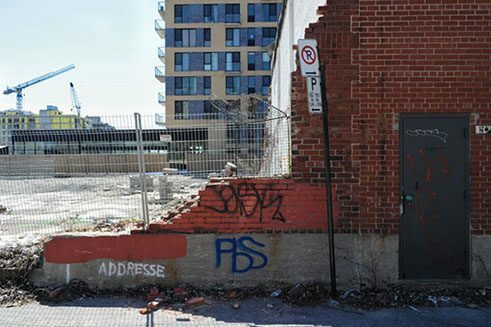 In the Griffintown neighbourhood the ancient factories and old houses are falling one after the other. Not so long ago I went there to see “La femme image”, a surrealist film by my friend the photographer Guy Borremans. When I now walk around the area, I’m not even capable of working out where the film might have been shown. 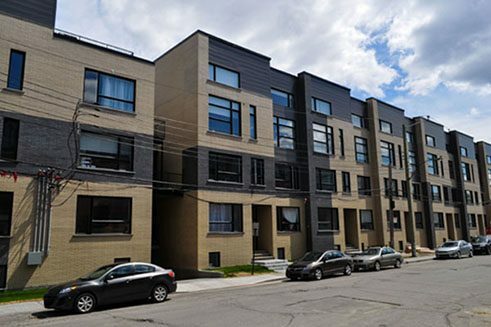 Little by little I am losing Montreal while projects like the one in Griffintown multiply with no over-all vision. Life in Montreal has migrated to the fringes without recognizing them as fully-fledged partners. The haughty and aloof references that are continually made about Longueuil, Laval, Brossard, Repentigny and other suburbs, united by the 450 telephone regional code, stand in the way of imagining what lies in store for Montreal. Before the Champlain Bridge, which is apparently on the point of collapsing, one of these suburbs has sprouted within no more than a few months in the middle of arable fields. Before stone farmhouses with their eaved roofs had stood there. They dated back to the middle of the 19th century, to the time when the occupiers had attempted in vain to rise up against the British Empire. Those houses were demolished or abandoned to make way for long rows of houses of a composite architecture of Victorian inspiration in which synthetic stone, aluminium, reproductions of Greek statues and Renaissance chimneys predominate. The aesthetics of collage reign. Montreal is also going the same way. But as in all large cities we continue to believe that this suburb contains nothing more than its own bombast, that it isn’t an integral part of the city’s skeleton. Suburbia, however, seems today to be the supreme example of a voluntary amnesia that has allowed Disneyland to take root throughout the city. In Montreal as elsewhere the culture of distraction has triumphed, as Walter Benjamin said. Jean-François Nadeau, historian and journalist at the newspaper Le Devoir, is the author of de Bourgault (2007) and of Adrien Arcand, führer canadien (2010). He also participates in several radio shows on the national broadcaster Radio-Canada.